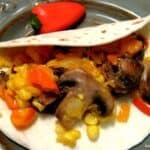 A low carb taco full of delicious veggies! Line a metal baking sheet with foil. Toss all veggies with olive oil and lightly season with salt and pepper. Spread veggies evenly onto baking sheet and roast in oven until tender, about 15 -20 minutes. Warm tortillas until soft and fill with veggie mixture.